The Site will not collect any personally identifiable information that is not voluntarily supplied by the user. The Site will not collect any personally identifiable information when you are browsing the Site. Certain actions on the Site require you to provide personal information such as your name, address, telephone number, email address, organizational information, and any other information that is necessary to complete that action, but no personally identifiable information will be obtained other than the information you enter. The actions that require your personal information include, but are not limited to, volunteer applications, nonprofit organization applications, request for further information, and donations. All of these actions are clearly marked and require a user to intentionally enter and provide personal information to the Site. The personal information you voluntarily provide to the Site will be used solely for the purposes set forth below. Individual Volunteers. We use the information you voluntarily provide to help facilitate the volunteering process. Programs need this information to begin your application. Please be aware that, to the extent required to provide our services, we share your information with other Volunteers or nonprofit organization partners. 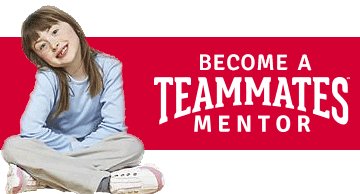 If you indicate on our site that you are interested in a particular mentoring opportunity and provide us with your contact information, we will forward your contact information to the organization that is hosting that opportunity so that the organization can contact you regarding your potential involvement. Requested Services. The Site will use personal information to provide the services requested by you. For example, if you request that TeamMates contact you, the Site will use your address or other personal information you entered to reply to your request. Aggregate Information. We may share aggregate information about our users with certain third parties. This information shows user activity as a whole rather than on an individual basis and cannot be used to individually identify you. We use this information to help our partners and funders better understand our services and also to report on public interest in mentoring. TeamMates strongly encourages nonprofit organizations receiving e-mail addresses from potential volunteers to adopt privacy standards similar to those of TeamMates. You should be aware that each such organization has its own policies regarding collection and use of personal information. TeamMates is not responsible for their use of your personal information. Inappropriate use of personal information received from TeamMates may jeopardize nonprofit listing on TeamMates”™ mentoring program database. TeamMates reserves the right to determine, in its discretion, what constitutes inappropriate use of this information. For more about a nonprofit organization”™s policy, please contact them directly using the contact information posted for that organization on our site. Information from the nonprofit organizations is used by TeamMates to consult with programs on ways to improve service. SafeSurf’s Internet Lifeguard Seven rules of online safety basics. WWK – Web Wise Kids Very good set of rules for children being online. i-SAFE Inc. Incorporates classroom curriculum with community outreach to empower students, teachers, parents, law enforcement, and concerned adults to make the Internet a safer place. Notwithstanding TeamMates”™ policy against sharing any information you have provided, the Company will release any personal information when it believes disclosure is required by law and when it believes that the disclosure of your personal information is necessary to protect the company”™s rights and/or comply with a judicial proceeding, court order, or legal process served on the company or the Site. You may request the information you submit to us be edited or deleted by sending an email to privacy@teammates.org or by contacting us as indicated below.